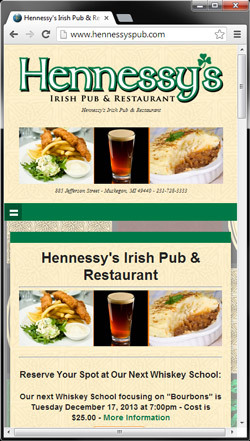 I recently got to build a great new responsive website for Hennessy’s Irish Pub and Restaurant located at 885 Jefferson Street in downtown Muskegon, MI. For those that do not know a Responsive Website refers to a website that changes design wise according to the size of your browser. The reason that is important has to do with the average user breakdowns which are in this day and age spread pretty evenly between normal desktop computers, laptops with smaller screens, tablets with even smaller screens and mobile devices which very dramatically in screen size. A true responsive site will look good on each of these, with different aspect ratios as this site does. The pic to the left shows this style very well as this is approximately the way it would look on a smartphone, which is very important as that part of normal searches especially for bars and restaurants is high, and in fact climbing everyday. Hennessy’s is a great upper class Irish Pub located just off of Clay in downtown Muskegon with at any given time approx 30 beers on tap, a great wine list, daily specials and live music every weekend. 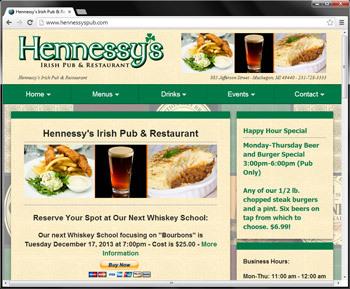 I approached Hennessy’s a few months back as they where a great business, with some great branding that was seriously lacking on the web, which is where I knew 231 Graphics could fit in and hit a home run. 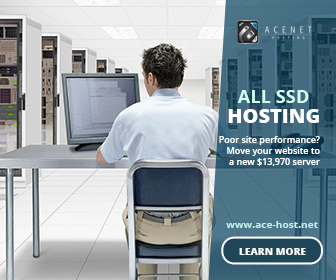 I found this client very easy to deal with and fun to build around this business. There was a little cool PHP script I wrote here too to read the day of the week off of the server and to always display the food or activity special for the day. Actually a very simple piece of code, but very cool. I had never really had a reason to do something like that before, I can think of a million ways to expand on this and turn it into something very cool. Originally Hennessy’s site had approx six pages, with no analytics or tracking, nothing you really needed to track conversions and was lacking in so many ways. The site now has approx 20 pages, breakfast, lunch and dinner menus, along with all of the drinks. A wine list, draft list, bottled beer and mixed drink lists. Everything you really need to know about the business. They where already using a simple Google calendar which they had gotten very used to, so we decided not to deviate from that, and kept it running pretty similar to the way it was initially set-up.